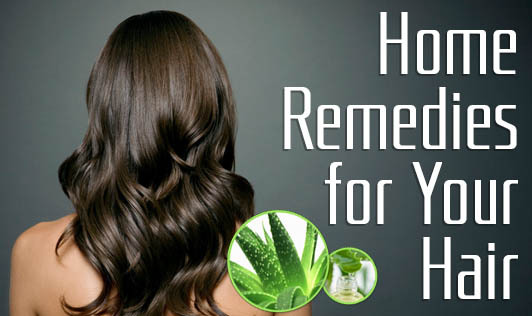 Your hair requires nutrition from inside out. Everyone wants to have smooth and shiny hair. Hair care is as important as skin care. Eating habits, lifestyle and stress are factors that can contribute to healthy hair. A tangled or roughed-up structure makes the hair look rough and dull. Poor diet, illness, and deficiencies of any particular vitamin and mineral affect the quality of hair. This also leads to problems like dandruff, thinning hair; balding, premature graying etc. Add curry leaves to coconut oil and boil it for 3-4 minutes on the stove. Rub that coconut oil on your scalp and on the soles of your feet at bedtime. Massage your scalp with Brahmi oil (available in all ayurvedic shops). This oil is rich in ayurvedic herbs that can help in better hair growth and prevent hair fall. Massage the hair with Vitamin E oil. This also may prevent or slow down hair loss. Castor oil is also equally helpful in hair growth. Egg and methi Powder pack: Mix egg whites with methi powder. Apply the paste for an hour and then wash off. Curd and gram pack: Curd and gram flour is a wonder paste to apply. It will improve the hair texture and growth. Egg and beer pack: Mix 1 egg yolk, 1 tbsp beer, 1 tbsp castor oil, 1 tbsp honey and cover hair from root to tips. Put on a plastic shower cap and wrap your head with a towel. Wash off after half an hour and do a final rinse with apple cider vinegar. Using this mask thrice a week gives excellent results. Beer and Almond oil pack: Mash 1 ripe banana and add to it 8 drops of pure almond oil (badamroghan). Mix very well and massage into your hair. Leave on for 25 minutes, and rinse off with apple cider vinegar or flat beer. White sesame is rich in magnesium and calcium, which will help in better growth of the hair. You could include some in your diet daily. Include 2 cups of yogurt every day (unless you are allergic to milk). If you are overweight, then choose low-fat curd. Drink 10-12 glasses of water every day. This will help in removing toxins easily. Include 2 cups of vegetables and 2 cups of fruits daily in your diet. Meet a nutritionist as she can help you with better hair care practices and a perfect meal plan for the same.